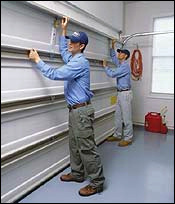 Unlike other venues, Garage Doors of Cleveland mandates that all of our installers are factory trained and certified to install our high quality products. This gives our customers the confidence that their door will be installed correctly, so that it looks great, functions properly, and keeps your home as energy efficient as possible. Best of all, by dealing directly with the factory, your warranty is certain to be honored in its entirety. Don’t get caught up in the he said, she said, finger pointing that can leave you without any recourse when the manufacturer, supplier, wholesaler, retailer, and installer, all work for different companies. Garage Doors of Cleveland is your one stop shop to having your premium quality garage door installed and guaranteed hassle free.